Software and human call processing have significant differences for businesses who rely on the accuracy of phone call information. 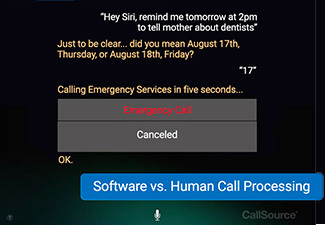 The difference between software speech analytics and human call processing is wide, but there are improvements. Technology has come a long way in the past 40 years making enormous leaps in speech analytics. Companies that find the newest system are quick to patent and secure their advances as the demand for speech-enabled devices grows year after year. Mobile devices are increasingly adding advanced speech analytics to enhance productivity, make driving safer, and texting hands-free. The goal of speech analytics for businesses is to affordably identify what happened on a phone call, if the caller a missed opportunity, and what this information can do to help both marketing and sales closing going forward. The goal of the patent creators is to be a little more accurate and have fewer errors than their competitors to have a superior product. These goals clash with the largest innovators of speech analytics technology whose goal is to make speech analytics better than human processing. There are three major problems that software speech analytics has to overcome: background noise, echo or reverberation, and the accent or dialect variations. Major scientific theories, algorithms, and models have taken shape around advances in modern computing allowing innovative ideas to finally become a reality. In the following sections, we will discuss these three major problems that you should consider if you are interested in call processing. 1. Background Noise: How well do Apple, Google, and Microsoft perform? Background noise is a contributing factor to the ability to clearly and accurately transcribe a conversation during a phone call. Sources of noise include wind, crowds, music, and even screaming children. Ideally, a phone call is placed by the caller in a quiet place where they can think and talk coherently. The loudness of the caller’s voice goes up and down. Pitch changes in the caller’s voice. The harmonic rate of words changes for the caller. The duration and pausing of syllable intensity shifts for the caller. The big takeaway of whether or not noise is a consideration for you and your business is how often has noise impacted your companies calls in the past, and what are you going to do about it? If even 25% of your businesses phone calls occur from cell phones, your business has been negatively impacted by noise in some degree – but it is ultimately up to you to put a dollar value on that expense. Having human call processing analysts screen and listen to your calls is one way to mitigate the factor of noise in calls. 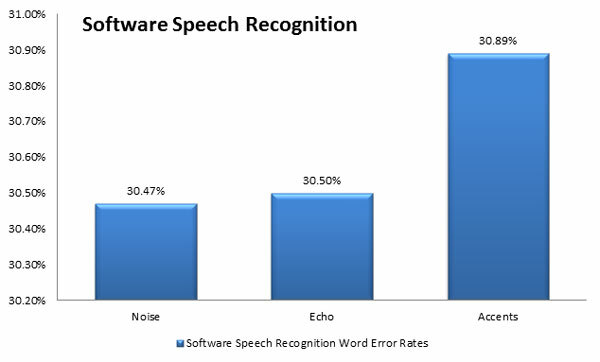 Software speech analytics software must account for the direction of the voice. A simple way to understand this problem is to carry on a conversation in an empty and hardwood floored house. If you start to hear your voice echo off the walls and floor, it interrupts what you are saying. 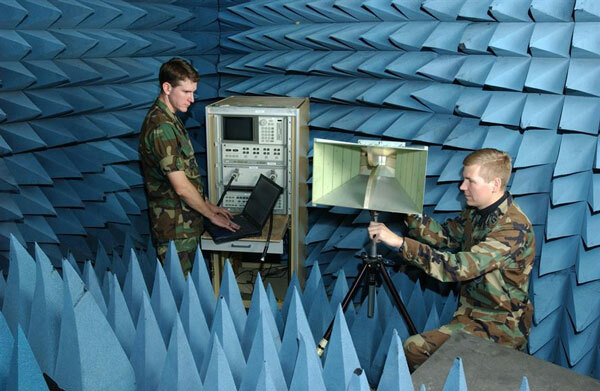 In the image above, the Airforce tests echo and reverberation in an echo-free room. As you can see, people typically won’t be calling your business from this type of place. A human call analyst is used to evaluate how well a system is at diagnosing echo and sound reverberation in the caller’s environment. After the phone call has been scored and transcribed by a human call analyst, the information is added to software speech analytics training data. The speech software will then attempt to transcribe the call and differences between the human transcription and the software transcription produces a WER rate. Rinse and repeat… over and over again millions of times to lower the average WER rate. Human call analysts vetted with years of call handling experience are put through a school with hours of training with typical calls, difficult calls, and how to avoid word errors. CallSource human call analysts are given amazing opportunities to work from their chosen locations, they are screened and trained on the best practices in the industry and are motivated to improve their accuracy rates continually. Once human call analysts are certified, they begin taking phone calls and work with mentors and colleagues to ensure that processes are being followed. Rinse and repeat… on their schedule, delivering the lowest WER rates in the industry. Speaker: TO ILLUSTRATE THE POINT A PROMINENT MIDDLE EAST ANALYST IN WASHINGTON RESOUNDTS A CALL FROM ON CAMPAIGN. Speech Recognition Software: TWO ALSTRAIT THE POINT A PROMINENT MIDILLE EAST ANALYST IM WASHINGTON RECOUNCACALL FROM ONE CAMPAIGN. Speaker: ALL THE EQUITY RAISING IN MILAN GAVE THAT STOCK MARKET INDIGESTION LAST YEAR. Speech Recognition Software: ALL THE EQUITY RAISING IN MULONG GAVE THAT STACKR MARKET IN JUSTIAN LAST YEAR. Both software speech analytics and human call analysts require robust systems to ensure that WER rates are as low as possible. WER rates directly contribute to businesses missing phone calls and misunderstanding what actually happened on phone calls. End to end speech software struggles to deal with echo and state of the art solutions continue to fall short the worse the noise and echo are in the environment of the caller. According to Wikipedia, the United States has over 30 major dialects of the English language. For native-born Americans, these apply to the geographic location you are born and raised, but also to the dialects of your parents. Assuming that all of your business calls are from callers with a dialect that software has trained on, you should be looking a moderately high but acceptable WER rate for accents. The diversity of your callers weighs heavily on the accuracy outcomes of speech analytics WER rates. You would see a shocking rise in WER rates for callers that come from a distinct dialect or who carry a unique accent separate from what the software has been training on. Accents and dialects represent a curve, such as a curveball, as utterances are spoken, and software attempts to accurately decode the words into coherent sentences. The degrading accuracy rates contribute to large gaps and word errors which may completely miss what was said or intended. When the outcome of what happened is dependent on a single word… and that word is usually interpreted incorrectly; the consequences are detrimental for businesses. Only small progress has been made in dealing with different dialects and accents as these interrupt the way that words sound to software speech analytics. The systematic approach required for robust software speech analytics is challenged by the need for a system that is adaptable to a large variance of pronunciation. Human call analysts also struggle with accents and dialects unfamiliar to them. However, one huge advantage that CallSource has is to select and hire human analysts who are familiar with those accents. There are call analysts who understand large sets of accents and dialects with ease and they are fully capable of the challenge. The quantifiable reasons that accents are difficult to classify, transcribe and decode have to do with the acoustic differences between accent groups. Those differences are difficult to account for while still accounting for noise and echo in the environment. For ESL (English as a second language) speakers who have thicker accents, the problems are compounded if they are not in ideally quiet and low echo environments. The detection of key phrases during a call is vitally important to understanding what happened during a call. How those key phrases are used is how that call will ultimately be classified by the system. Marketing and sales are unable to move forward effectively without accurate information of what happened during an initial phone call into the business. Advances in the improvement of accents will have to be developed in every accent and dialect individually and added to training data collectively to overcome the problem of high WER rates. You should ask yourself: are you clever enough to handle high phone call accuracy rates? Can you make a difference in your business by knowing what happened on every single call? Can you achieve the results you need even with pages of word errors? We think you are clever. Asking the caller to call you back from a quieter place over 30% of the time. Asking the caller to move into a room with fewer echoes over 30% of the time. Having to task a sales or service employee to re-listen to 30% of phone calls from a region with specific accents. Asking the caller to call you back from a landline or a location with better reception. The differences between software-based speech analytics and human call analysts comes down to how much of an impact accuracy makes in your business. Talk to your appointment setters and ask them if they ever have trouble hearing what people are saying because it’s a good bet that if they have ever had trouble, your call processing has had trouble. Assefi, Mehdi, et al. “An Experimental Evaluation of Apple Siri and Google Speech analytics.” An Experimental Evaluation of Apple Siri and Google Speech analytics, www.cs.montana.edu/izurieta/pubs/sede2_2015.pdf. Hannun, Awni, et al. “Deep Speech: Scaling up End-to-End Speech analytics.” [1412.5567] Deep Speech: Scaling up End-to-End Speech analytics, 19 Dec. 2014, arxiv.org/abs/1412.5567. Kat, Liu Wai, and P. Fung. “Fast Accent Identification and Accented Speech analytics.” 1999 IEEE International Conference on Acoustics, Speech, and Signal Processing. Proceedings. ICASSP99 (Cat. No.99CH36258), 1999, doi:10.1109/icassp.1999.758102. Senior, Andrew, et al. “An Empirical Study of Learning Rates in Deep Neural Networks for Speech analytics.” An Empirical Study of Learning Rates in Deep Neural Networks for Speech analytics – IEEE Conference Publication, 2013 IEEE International Conference on Acoustics, Speech and Signal Processing, ieeexplore.ieee.org/document/6638963/. Zhang, Ying, et al. “Towards End-to-End Speech analytics with Deep Convolutional Neural Networks.” [1701.02720] Towards End-to-End Speech analytics with Deep Convolutional Neural Networks, Cornell University, 10 Jan. 2017, arxiv.org/abs/1701.02720.